Amidst all the cat fights and drama on the reality show, Bigg Boss, love finds space to blossom between the celebrity housemates. Some love stories fizzle out as soon as the show is over while some have survived for quite a while. Here’s a look at the couples who found love in the Bigg Boss house. They were the first couple of the Bigg Boss house who connected well on the show. Anupama and Aryan were very much in love and spent all their time together in house. Their love fizzled out once they were out and back in their regular life. Was it a strategy to garner more support and votes during the show? They were called UpMa by their fans. Upen Patel and Karishma Tanna grew close during the Bigg Boss Season 8. Lover boy Upen worked his magic on the charming Karishma, so much so, that she even broke up with her then boyfriend Rushabh Choksi. The couple is still very much in love and are still together. They were another couple from the Bigg Boss Season 8. Gautam Gulati who went ahead to win the Season 8 of the show shared some sizzling moments with model and actor, Diandra Soares. Sadly, after Gautam won he denied their relationship while Diana admitted she was in love with him. 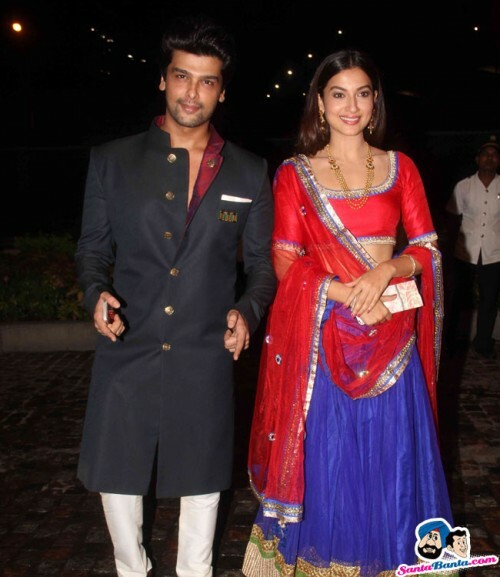 Gauhar and Kushal were never seen without the other during the Season 7 of the Bigg Boss. When Kushal was evicted from the Bigg Boss house, Gauhar too left the show voluntarily only to come back with a bang. The model and actress went on to win Bigg Boss 7 and ‘Gaushal’ dated for a while before religious differences tore them apart. In Season 4, Veena Mallik and Ashmit Patel’s close chemistry was seen. Couple were seen indulging in kissing, hugging, and massaging each other inside the Bigg Boss house. Outside the Bigg Boss house, they worked together in the movie Super Model which released in 2013. They say that Veena and Ashmit were not on talking terms during the making of this movie, so Director Navin Batra had to play the role of a peace maker for the ship to sail smoothly. It was believed that, Rahul and Payal were dating each other before they entered the Bigg Boss house in Season 2. They were seen massaging each other in the house and getting close, up and personal in the swimming pool. The first couple to ever get married in the Bigg Boss house, Sara and Ali made big news and hogged limelight for quite some time after Bigg Boss 4. However, their marriage didn’t last long after leaving the Bigg Boss house and they both went their separate ways. In Bigg Biss season 5,Pooja Bedi and Sky were the couple that survived even outside the house. The couple has been together for the longest time and they’re so in love that Sky even got Pooja’s name tattooed on his right arm. Looks like both have found their happily ever after. Tanisha and Armaan were seen getting cosy with each other in Bigg Boss Season 7. The love birds went on dating for quite some time even after the show and rumours of their marriage was doing the rounds too but eventually the duo split due to personal differences. In Bigg Boss season 2, Diana Hayden and Ashutosh was seen getting closer to each other and it appeared that they genuinely liked each other but, not much was heard about the couple after the show ended. Did we miss mentioning about any Celebs Who Fell In Love In The Bigg Boss House?